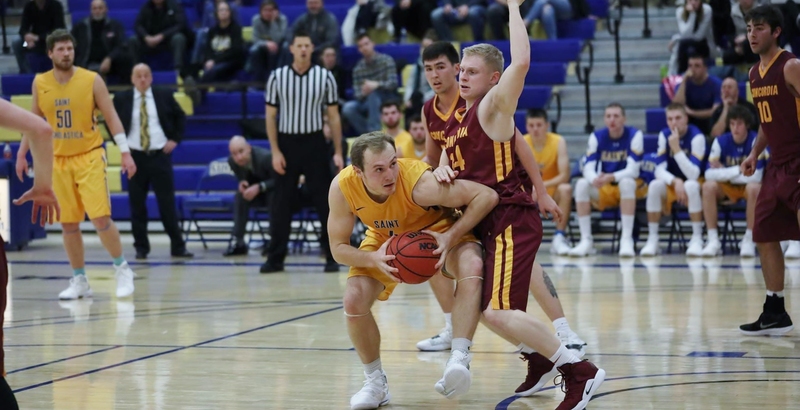 DULUTH, Minn. (csssaints.com) – The St. Scholastica men’s basketball team out-scored Concordia College-Moorhead 28-4 over the final eight minutes to rally and run away from the Cobbers 72-56 Monday night in its home opener at the Reif Gymnasium. Concordia (1-3) was quick to score and opened up with a 10-3 run in the first five minutes of play. However, the Saints would not be subdued. After a timeout with 12:47 remaining in the half, St. Scholastica’s clean defense and aggressive offense allowed Brandon Newman (Barnum, Minn./Barnum HS) and Zach Sjoblad (Pequot Lakes, Minn./Pequot Lakes HS) to combine for a 9-0 run to tie the game 17-17. It would be almost three minutes later that a pair of free throws from Quinn Fischer (Esko, Minn./Esko HS) would give the Saints a 21-19 advantage; their first lead of the night. The Cobbers quickly stole the lead back and would hold it until the half was nearly over. With 24 seconds left in the half and down by one, the Saints ran down the clock for one final shot. As time was winding down, Fischer was able to find a lapse in the Cobbers’ defense and sunk a three-pointer to give the Saints the 31-29 benefit going into the second half. The first eight minutes of the second half would be back-and-forth with neither holding more than a four-point lead. When the clock hit 11:43, Concordia initiated a 12-3 run to take a 52-44 lead with eight minutes remaining. Once again, the Saints were relentless. Similar to the first half, out of timeout, St. Scholastica responded in a big way with a 9-0 run and a Sam Thompson (Duluth, Minn./Duluth East HS) 3-pointer gave the Saints a 53-52 lead. Then following a Concordia bucket to regain the lead, St. Scholastica proceeded to make 3-pointers on four consecutive possessions in the final four minutes to open up a big lead The Saints would sail through the final minutes to a 72-56 win. Fischer led the Saints with 18 points and a season-high nine rebounds. Newman added 16 points to the mix while Nate Weets (Cloquet, Minn./Cloquet HS) tallied 14 along with six assists. Thompson finished with 11 points. Fischer and Weets each had eight points in the final eight minutes of the second half. Jordan Davis had 19 points and 13 rebounds for the Cobbers. The Saints (1-3) will travel to the University of Wisconsin-Eau Claire on Saturday to compete in their final game before conference play begins. Tip-off is scheduled for 5 p.m.